1. Gibralter Creek – 6/23/2011 – Not only did I catch my first 24″ rainbow trout, but I also enjoyed my best afternoon of fishing during my Alaska Rainbow Point Lodge trip. 2. Conejos River – 7/21/2011 – A bear encounter didn’t stop me from experiencing a great day of fishing on the scenic upper Conejos River. 3. 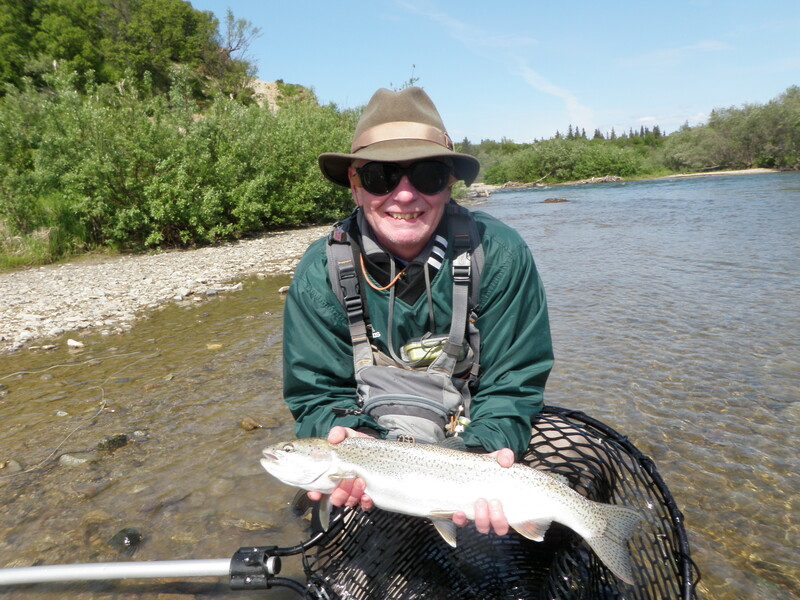 Tommy Creek – 6/24/2011 – Another stream draining into Lake Illiamna brought me my second 24″ rainbow along with some other nice fish. My guide, Jordan, tied fry flies the night before, and they worked their magic. 4. 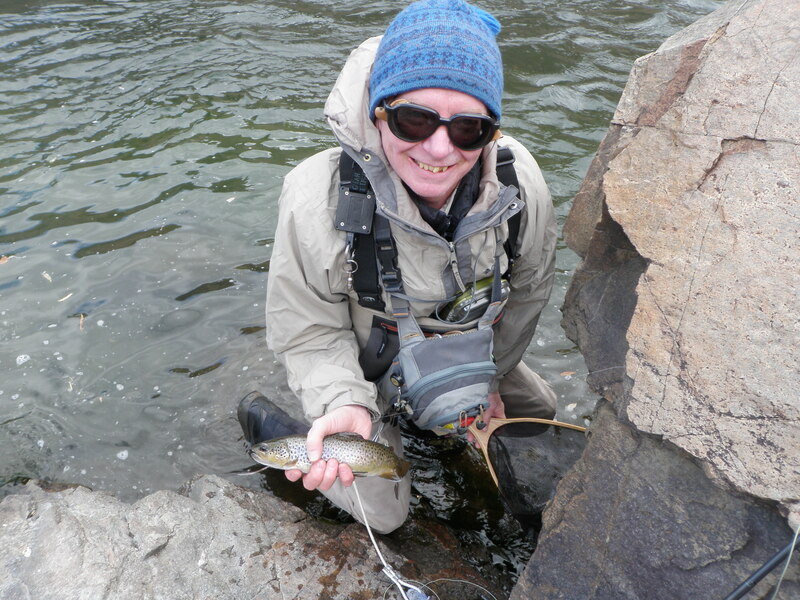 Copper River – 6/22/2011 – I read articles about catching large rainbows on a mouse fly and actually accomplished the feat on the lower Copper River. 5. 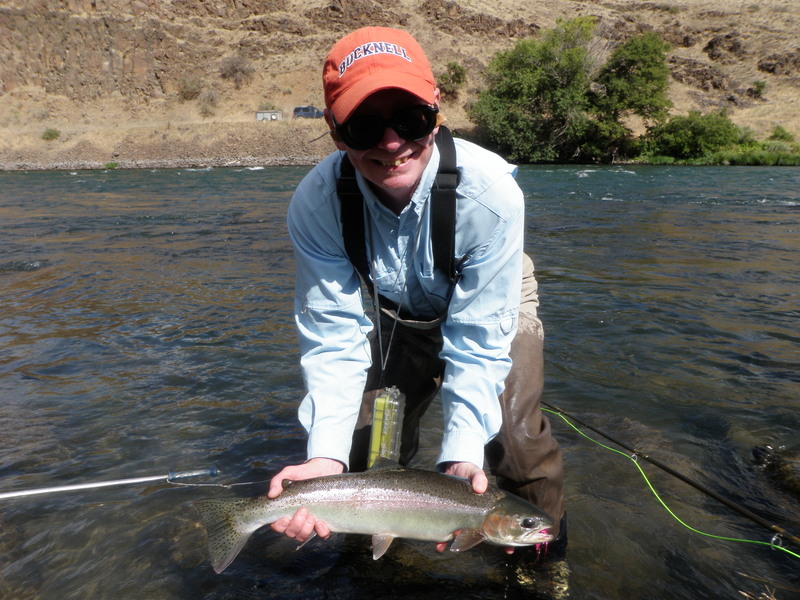 Deschutes River – 8/24/2011 – It was a long tiring day of relentlessly casting a spey rod, and it paid off with my first and only steelhead. It was worth it. 6. South Platte River – 10/15/2011 – Jane, Dan and I hiked into Wildcat Canyon on a beautiful fall day. I landed 23 nice fish, but more importantly Dan had a great day, and it was fun to be with my family. 7. 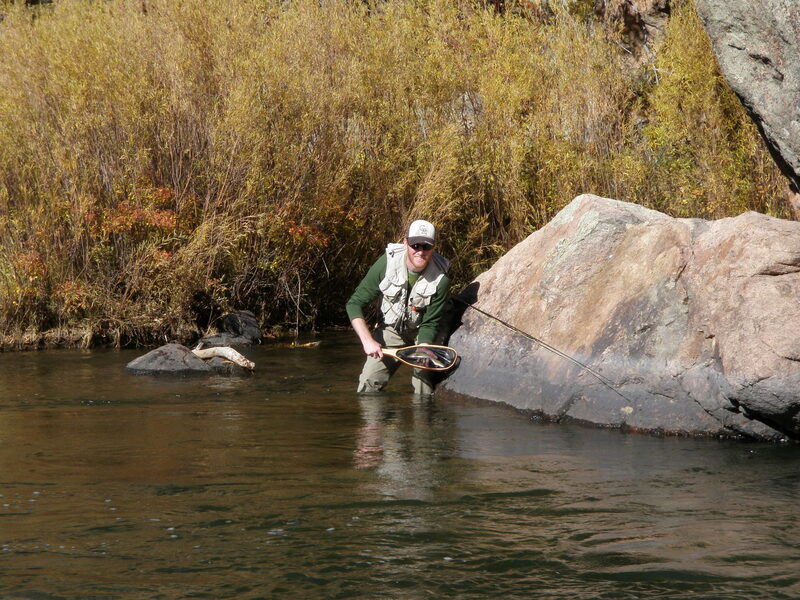 Big Thompson River – 10/5/2011 – This was perhaps my best day ever on the Big Thompson as I landed numerous nice rainbows using a size 16 light gray deer hair caddis. 8. Arkansas River – 9/13/2011 – Another day of catching nice rainbows this time using the dependable yellow Letort hopper was enjoyed. Amy and her roommate Joe accompanied me on this trip, so the drive was a lot of fun both ways. 9. Frying Pan River – 9/6/2011 – I foolishly left my newly tied green drakes behind in Denver, but managed to have a great day anyway. Jane, Dan and Amy arrived at 3PM, and I was able to land four or five on the new drakes. Dan fished with me for several hours, and I enjoyed watching him succeed in landing some nice fish. 10. Arkansas River – 9/25/2011 – I read a report suggesting that small flies such as tricos and BWO’s were working on the Arkansas River. It was one of those rare occasions when the suggested flies actually worked. There you have it, the best of 2011. 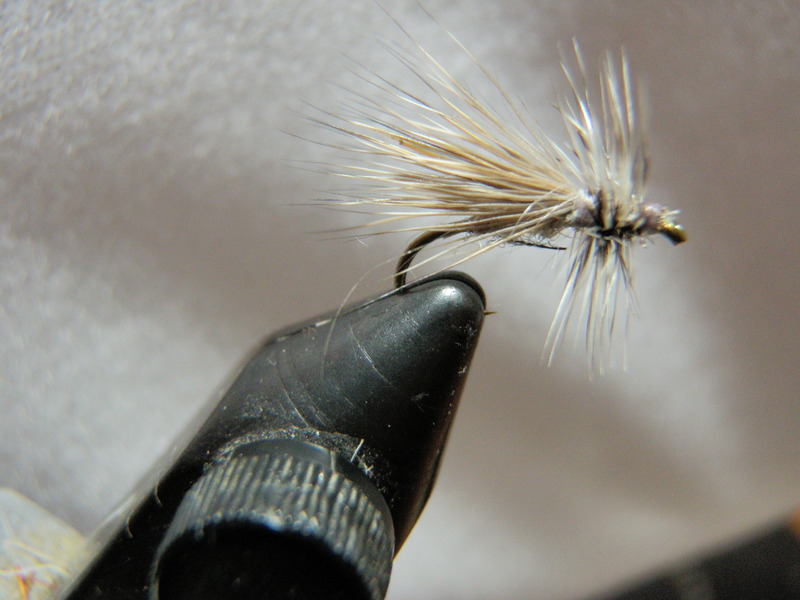 Another fly that I discovered I was in short supply of late in the season was the light gray deer hair caddis. 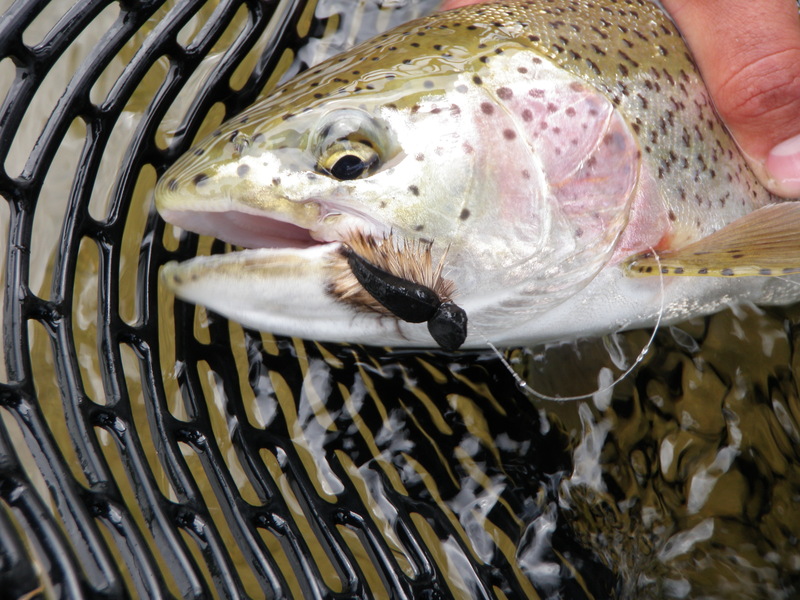 This fly proved to be a huge winner in one of my late season outings on the Big Thompson River, and it was after this experience that I discovered my shortage and I tied eight more before visiting the South Platte in Wildcat Canyon. Dark bodied deer hair caddis seem to be the desired fly of trout early in the season, but by August, September and October gray or light colored caddis seem to be a better imitation. The late season caddis I’ve captured seem to have a yellow hue, but the light gray poly dubbing that I use seems to work across a broader range of matching situations than yellow. 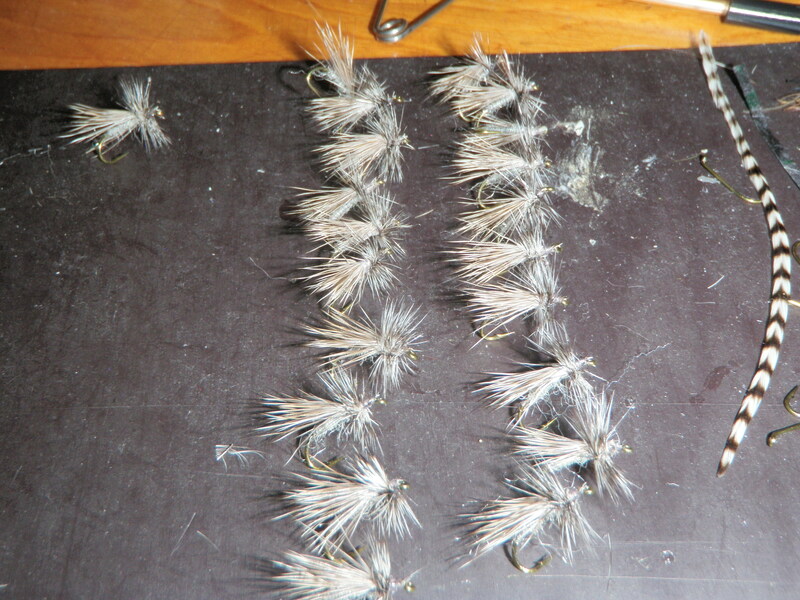 When I tallied my list of fly tying requirements, I realized that I needed to make quite a few light gray and olive brown caddis in size 16, so I purchased a $25 pack of Whiting saddle hackles rated size 16. These are extremely long saddle hackles with size sixteen along the entire length. 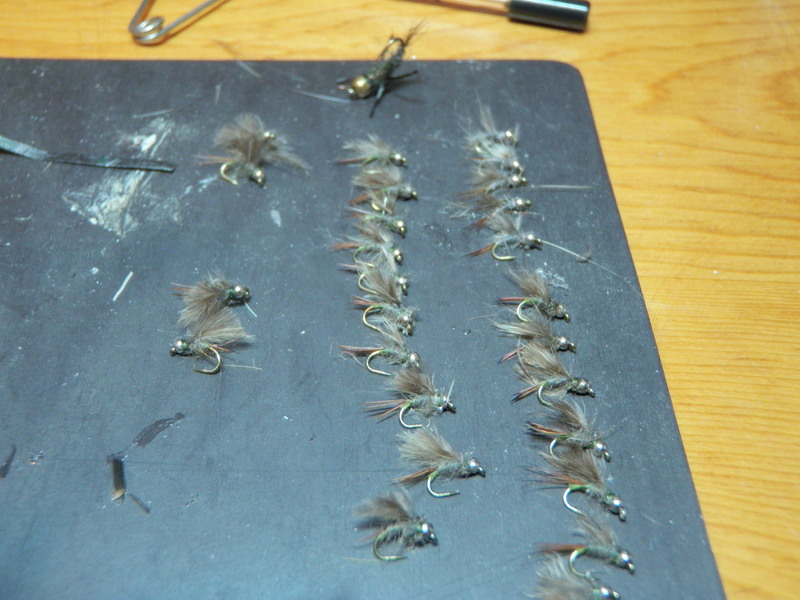 What a pleasure it was to tie twenty light gray deer hair caddis with the long saddles as I used approximately 2.5 feathers to complete 20 flies. 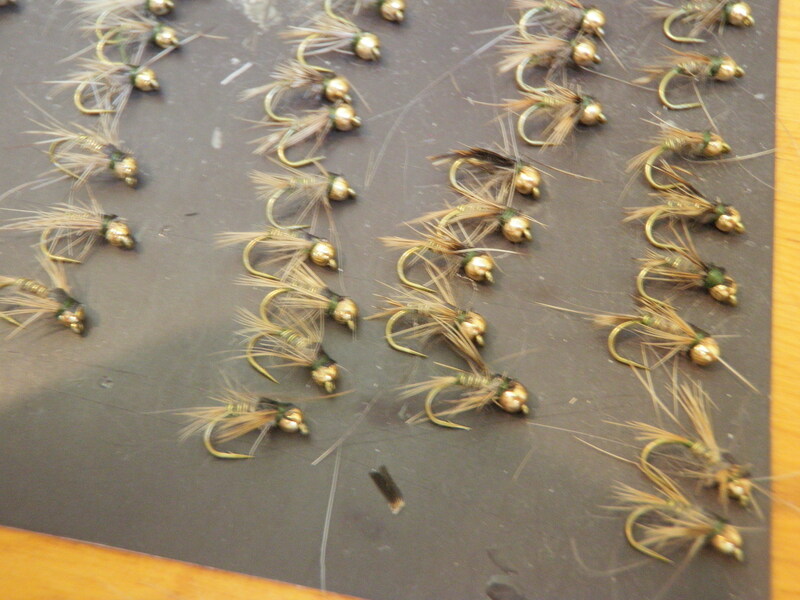 I tie my size 16 caddis in a very sparse manner with a narrow body and no palmered hackle over the abdomen. I make a full wrap around the deer hair before cinching it down on top of the hook to prevent the deer hair from rolling around the hook shank. I apply some head cement to the thread wraps that serve as the base for the deer hair, and I usually make four wraps of hackle in front of the deer hair wing. I’ve been in several situations where I caught fish with my sparse caddis when others failed or had less consistent success. 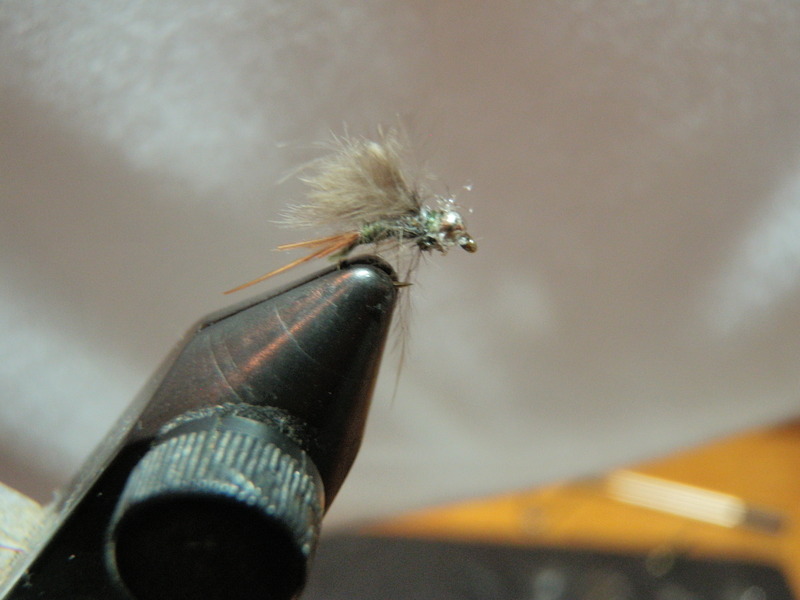 Perhaps the second most productive fly in my arsenal after the beadhead hares ear is the beadhead RS2. Whenever I see any BWO adults in the air, I quickly tie a beadhead RS2 to my line. Sometimes the RS2 is a second dropper from a large buoyant attractor, and this can be a deadly approach. Other times I add a strike indicator and split shot and then a larger nymph followed by the beadhead RS2. When the fish are very active chasing emergers, the deep method seems to outperform the dead drift dropper approach. 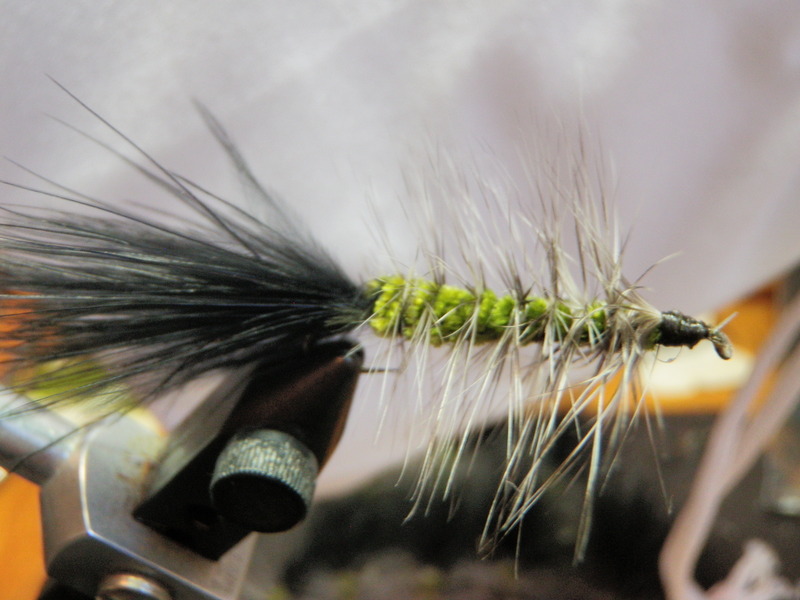 This is another fly that I stocked too few of entering the 2011 season, and I was forced to tie an extra supply late in the season. Consequently I have only five in inventory and needed to tie an additional 25 to build my stock to 30. Happily this was accomplished over the weekend, and I hope to be adequately prepared for BWO hatches in 2012. 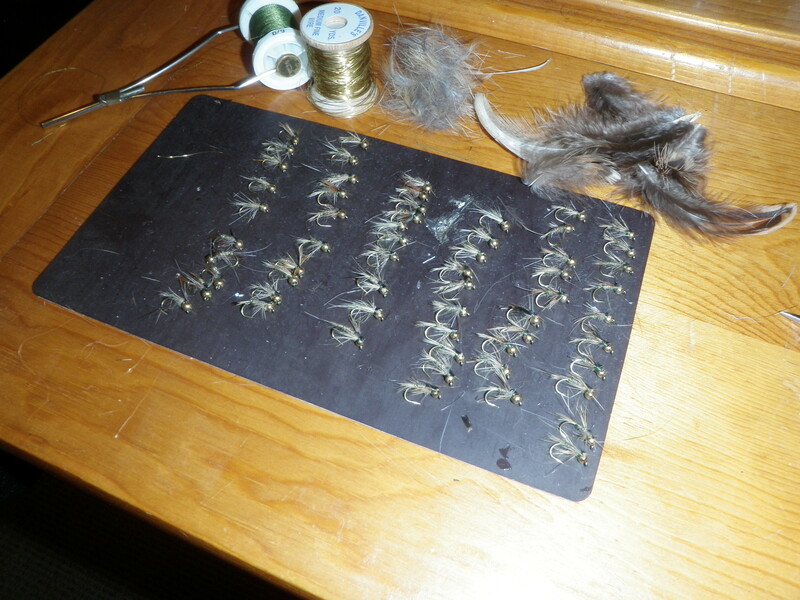 I began the 2010 season with 50 beadhead hares ear nymphs in my fly boxes and almost ran out. I actually had to take time away from fishing to tie an additional fifteen toward the end of the season. The beadhead hares ear is my absolute “go to” fly, and it seems to catch fish no matter where or when I’m fishing. 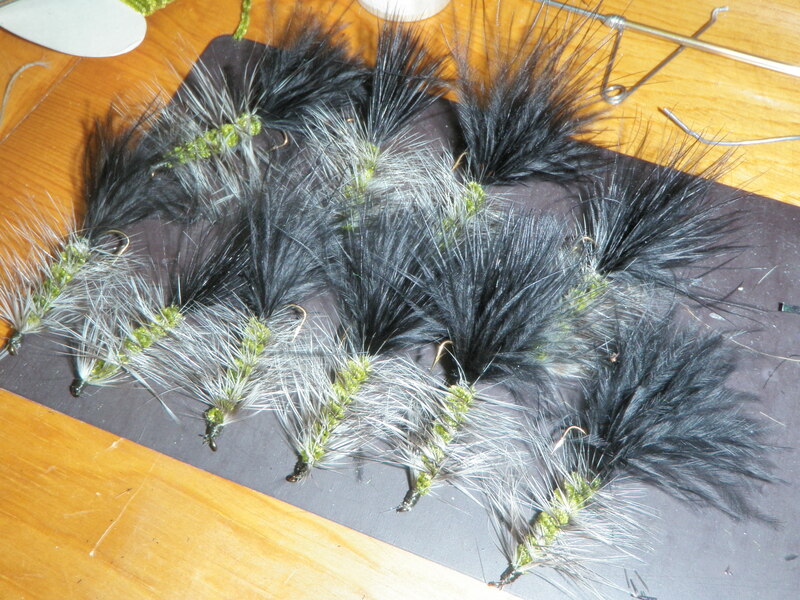 My goal for 2011 was to tie enough so that I had 70 in my fly boxes at the beginning of the season, and I’m happy to report that this goal was achieved. I scheduled some time each day to tie five flies after I arrived home from work and held to this fairly rigorously. If the season started tomorrow, I’d have beadhead hares ears, and I’m confident I’d catch fish. The days remaining in 2011 were dwindling, particularly the days nice enough to get out on a stream and fish. With unseasonably warm days forecast for Thursday and Friday, November 17-18 I cleared an afternoon on Friday to resume my quest to surpass the 2010 cumulative fish count. I wanted a destination within an hour of Denver and limited my options to Clear Creek, Bear Creek or the South Platte River. 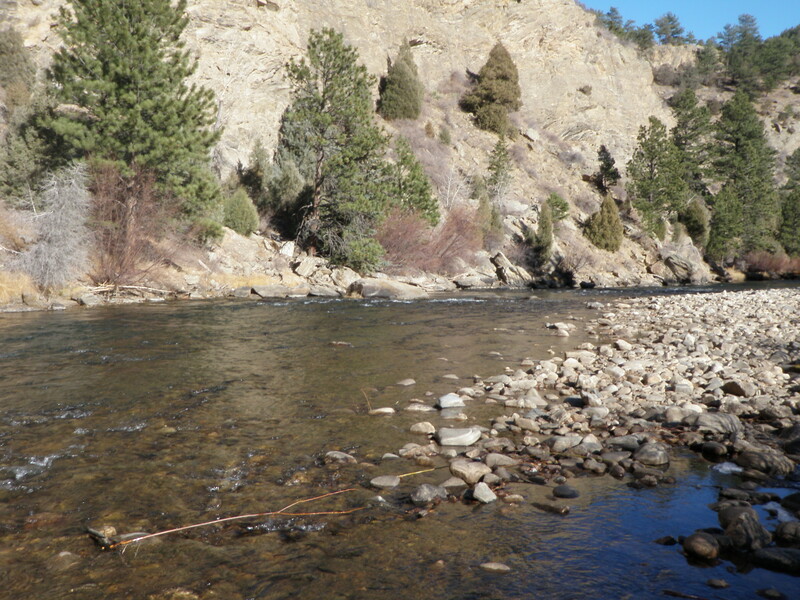 The South Platte flows were extremely low at 50 cfs, and that makes for difficult fishing. Bear Creek is a very small stream, and low fall conditions would make this a challenge as well. By process of elimination I chose Clear Creek. 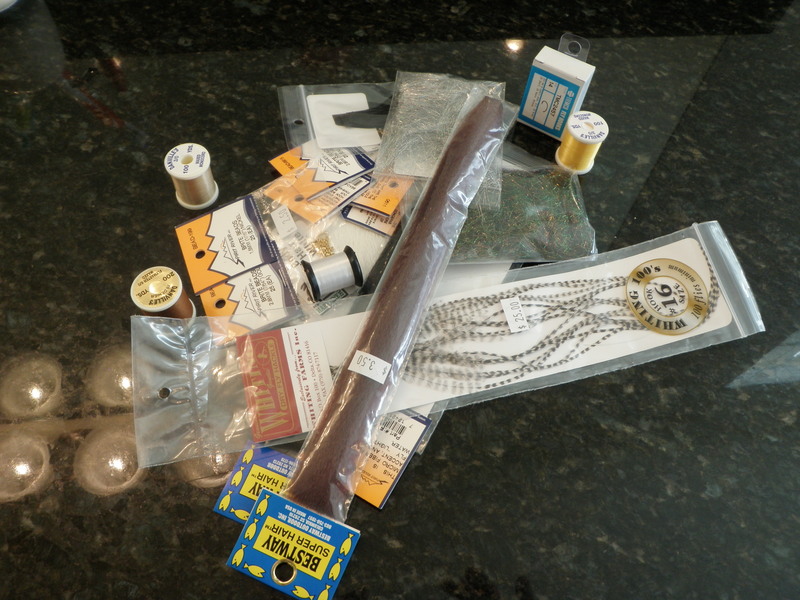 I left work at 10:30AM, returned home and tossed all my fishing gear in the Santa Fe including a lunch. I arrived at the Hidden Valley exit off of interstate 70 at noon and parked at the bike path trailhead and ate my lunch. I was on the water by 12:15 and elected to walk down the path to a place where the stream fans out into a nice slow moving deep pool. I discovered there was a five foot wide ice ledge along the side that I was fishing from. The water wasn’t very deep so I tied on a parachute hopper and added a beadhead hares ear and then a RS2 as the point fly. I began casting to the main central run and drifting my flies along the seams into the center of the pool as it fanned out into the deepest section but I had no results. Next I probed the deep water within a couple feet of the ice shelf and moved to the top of the pool with no success. I hiked along the bike trail toward the car and dropped down to a couple sections where there were nice deep slow moving troughs along the south bank, and again did not experience any success. In fact, I did not spot a single fish and the area I was fishing was totally covered by the shadows of the hills running along the south side of the narrow valley. When I arrived at the car, I carefully picked my way down the steep bank and fished the nice wide deep pool below the parking area. Judging from the well worn paths, this area received a lot of pressure, and sure enough I couldn’t connect with any fish in spite of thorough prospecting of the tail, midsection, and top of the area. This pool had a wider shelf of ice along my side of the stream, and I broke a few chunks loose in order to wade closer to the top of the pool for some nice drifts. Catching number 531 was beginning to look quite bleak as I contemplated my next move. The stream made a forty-five degree bend to the north and then flowed under the on ramp to I70 and then under the eastbound and westbound lanes of the highway. It appeared that the sun was hitting Clear Creek on the other side of the highway, so I decided to make my way under the highway and explore the north side. As I approached the first bridge I noticed some nice short pockets so I unclipped the flies and tossed a cast along the left bank. As I lifted my rod to make a second cast, I felt a throb and set the hook and spotted a small brown thrashing in the water. Could this be the one? Unfortunately when I brought the fish to my net I noticed that the tiny RS2 was embedded in the side of the small brown, and I’d foul hooked the fish. I’d rather settle for a tie than count a foul hooked fish so I quickly released the fish and resumed my quest. At least I’d now found evidence that fish were in the stream and perhaps showing some interest in following a fly and eating. I was beginning to doubt the dry/dropper strategy, but before switching to an indicator and fishing deeper, I decided to fish the existing flies in the shadows under the highway. I could switch to deep nymphs once I exited to the sunny north side. 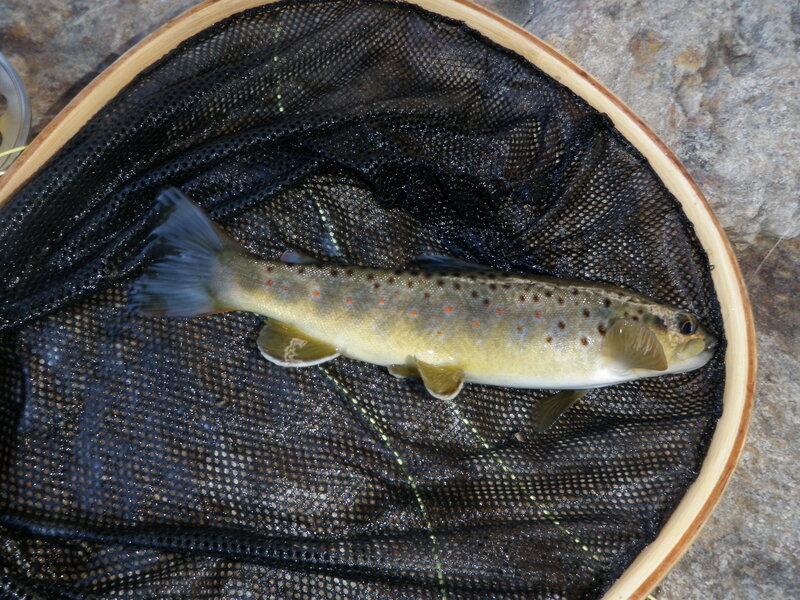 There was a nice deep slot opposite where I’d foul hooked the small brown so I waded into the stream a bit and cast the hopper and nymphs to the top of the slot and let it drift to the tail. Just as the flies began to drag at the tail I noticed a flash and set the hook and played a nine inch brown trout to my net. This fish was hooked in the mouth by the RS2 and represented the much sought after number 531 for the 2011 season. 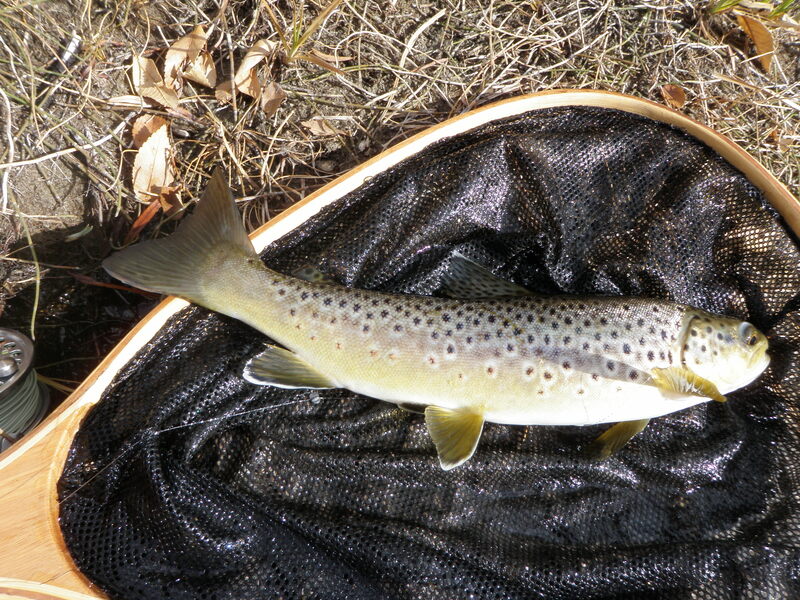 I photographed the brown on top of a nice waist high rock and released it to resume its winter survival ordeal. I moved up along the stream a bit further and in short order discovered that my landing net was no longer clipped to my Fishpond front pack configuration. Apparently in my euphoria over catching a fish, I’d forgotten that the net was decoupled, and I’d allowed it to drift down the stream. I was cursing myself as I retraced my steps to the large rock, and sure enough it wasn’t visible. I’d lowered the fish in the net to the water, removed the hook, released the fish and gathered my line while allowing the net to drift away. Could I walk downstream and find the net lodged on a rock or stick? I was skeptical but decided to scramble downstream to the car and have a look. Fortunately when I got to the parking area and looked downstream I saw my net lodged against a large rock protruding above some shallow riffles. I quickly scrambled down the bank and waded to the shallow riffle area and retrieved my net. Next I moved back up under the I70 overpass and fished some additional interesting pockets and slots to no avail. I emerged out of the shadows on the north side of the highway and circled past some wide shallow unattractive areas until I approached a nice area with riffles running three to four feet deep. I made some nice casts here but saw no action and moved to another nice run with some depth along the rocky northeast bank. While standing at the tail of the run, I spotted a small brown briefly look at my fly, but it quickly returned to its holding spot and then ignored more repeated drifts over it. This provoked me to remove the hopper, and switch to a strike indicator and split shot with the same two nymphs that I’d been fishing below the split shot. I worked the upper part of the run I was in and then moved up to the next attractive water. Here there was a large protruding midstream rock and then eight feet below a large subsurface rock and then a nice soft pocket below that. I drifted the nymphs through the soft pocket repeatedly with not action, and then waded up a bit to cast into the short pocket behind the protruding rock. The combination of the two rocks created a situation where the current was being sucked back upstream against the large rock so my indicator moved back toward the rock and remained stationary. After allowing it to sit motionless for a bit I lifted my rod to recast, but as I did so, a fish grabbed the beadhead hares ear. 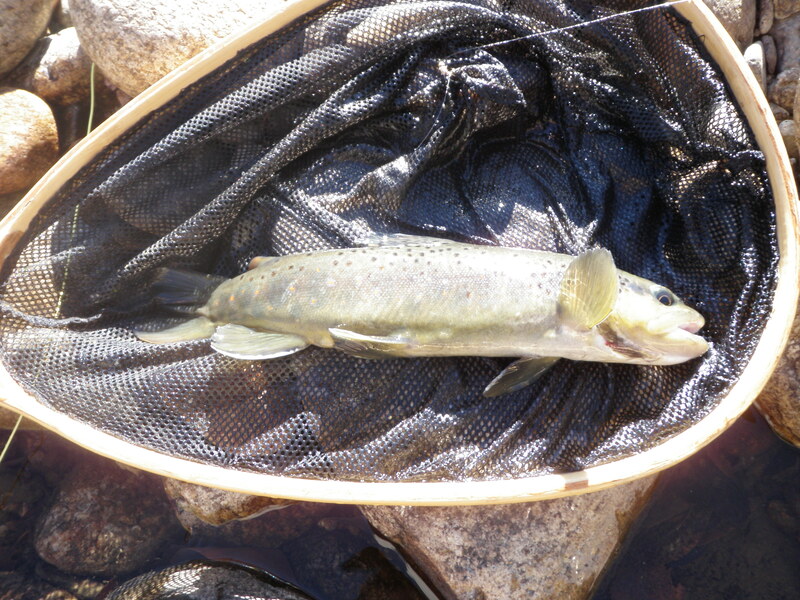 This fish was around eleven inches and I quickly played it to my recovered net, photographed and released it. I continued up the stream a bit further, but the water was largely unattractive as it widened out into shallow riffles. Next I would need to continue underneath the highway into the shadows again, and it was around 2:30 and I wasn’t excited about going back into the shade as the temperatures began to decline so I called it a day satisfied that I’d landed two fish and surpassed my cumulative fish count of 2010. The weather forecast for Denver was highs of 61 degrees, so I felt it was an opportunity for another late season fishing venture. Jane decided to join me for a drive to the Arkansas River, and we set off by 8:45AM for the three hour drive to the destination below Salida at the Fremont-Chafee county line. The fish counter on my fishing blog revealed that I needed to catch three fish to equal my 2010 cumulative total, and I’d be misleading readers if I didn’t concede that this was a goal foremost on my mind. We tracked the air temperature on the dashboard thermometer as we crossed South Park on US 285 and the reading troughed at 35 degrees on the top of Kenosha Pass. By the time we reached the pullout along the Arkansas River the temperature had improved to 50 degrees. The wind was gusting quite vigorously as I pulled on my waders so I decided to wear my down vest with my rain jacket as a windbreaker, and I chose my ski hat for head protection. I munched down my lunch and was ready to fish by noon. I elected to use my new Scott 6 weight that I’d purchased for the Alaska trip as I expected to fish mostly nymphs and streamers and punch casts into the wind. My first casting foray was from the high rocks just below the pullout where the car was parked. During previous trips in the summer and fall I had spotted numerous fish in this location and figured they’d still be there. Sure enough after five or so casts I moved to the edge of the high rocks closest to the river and spotted a decent fish swimming from the edge closer to the current fifteen feet into the river. I flicked a cast with the thingamabobber trailing a beadhead hares ear and beadhead RS2 twenty-five feet upstream so it would drift to the area where the river dropped off into deeper water. On the second drift the indicator dipped, and I set the hook and was attached to a nice thirteen inch brown that grabbed the tiny RS2. Jane was nearby so I asked her to hold the rod with the fish while I scrambled down from the large rock. Jane handed the rod back to me and I landed the fish and Jane snapped a photo. I couldn’t coax anymore fish from this area, so I decided to cross the river at the tail of the long pool and hike down the railroad tracks. I didn’t intend to go as far as the small island, but once I climbed the steep bank to the tracks, I got on a roll and ended up below the island anyway. I began in a nice riffle below the island and in short order on an upstream cast; I hooked and landed a slightly larger brown on the beadhead hares ear. The productive right channel north of the island was still ahead, and I was one fish away from 530. I fished the next stretch of good looking water below the island with no results and then moved up into the right channel as I faced upstream. There is a decent pool two thirds of the way down the right channel, and I skipped the shallow tail section assuming that the fish were holding in deeper water with the cooler water temperatures. I reached a nice deep trough behind a protruding rock at the top of the pool and placed a cast midway up the trough above a large submerged rock. As the nymphs began to sweep around the rock a brown grabbed one of the flies, and I had a momentary hookup, but in short order the fish was free. I’d missed an opportunity at 530 fairly early in my outing. Next I punched a cast into the wind so the nymphs hit the water right behind the protruding rock. As the indicator drifted on the current seam the indicator darted, and I made a strong hook set and saw a nice rainbow streak downstream past me. Eventually I applied pressure and stripped some line before the rainbow once again reversed and headed downstream a bit. Again I applied upstream pressure and as I brought the rainbow upstream a few feet, it turned its head and the tiny RS2 popped free. I’d missed an opportunity to land a beautiful rainbow that would have tied me with the 2010 fish count. When I got to the top of the island I climbed up on the bank to circle around the shallow tail of the next run in order to reach the deeper runs and pockets along the bank further upstream. I heard a voice and noticed Jane had walked down the highway, and she was checking to see how many I’d landed. I called out, “Two to go” and resumed my quest. Jane continued to track me along the highway shoulder as I worked my way up the river and as I waded into position to continue casting. It was now around 1PM and the wind began to gust fiercely directly into my face. I was using a 9’6” 6 weight rod with a split shot and strike indicator and still was having trouble getting my cast upstream. Finally after covering around thirty yards of decent water, on a drift through a nice deep trough near the north bank, the indicator bobbed, and I hooked and landed number three on the day and number 530 on the year. It was a nice brown roughly the same size as the second catch. I called out to Jane that I was now even and looking for one more fish. My hand was wet from releasing the fish and also from constantly grabbing the handle of my wading stick, and it became quite gnarled and chilled from the rapid evaporation caused by the wind chill. I moved up through a few more deep pockets with no results before reaching my crossing point. It was now around 2PM and already the sun had dropped below the ridge to the southwest so that the entire river was covered in shadows where I was fishing. I crossed over at the tail of the pool and climbed the bank and returned back to the high rock where I’d begun the day. As I cast the nymphs into the wind I created a huge tangle around the strike indicator. I had to clip off both the flies and even after doing so, spent quite a bit of time unsnarling the immense tangle of monofilament. The wind was blowing hard and causing my net to repeatedly bang against my leg in an annoying fashion. Once I’d finally straightened the line, I decided to try a streamer in the late afternoon shadows. I tied on a huge yellow-olive articulated streamer with lead eyes that I’d found while fishing the Taylor River in 2010. I flicked this out into the current above the deeper water next to the high rock and let it swing down and across below me. I executed this process repeatedly and then moved up higher in the run and repeated with shorter casts. Nothing was going for the streamer. I spotted a nice deep pool behind a large vertical rock 25 yards upstream so I walked up along the shore to this point. There were trees behind me, and I was having difficulty getting a backcast to fling the heavily weighted streamer out to the edge of the current. After ten casts with no results, I attempted to backcast downstream and then fling the fly toward two o’clock, up and across from my position. But on the backcast I either hooked some debris or snapped off the fly. The wind was still blowing unrelentingly, and I just spent 10 minutes untangling a mess, and I was quite chilled in the shadows of the canyon so I decided to call it quits and settle for a tie with 2010. When I returned home and checked the weather, I noticed that Thursday highs in Denver are forecast to be 61 degrees. The book is not yet closed on 2011.